In stock -This product will ship today if ordered within the next 10 minutes. This combination of Cavacurmin®, Turmacin® and whole powdered root provides a complete range of turmeric actives for maximum benefit. The convenient, yet natural form of this product also allows for advanced absorption into the body. Cavacurmin® delivers curcumin that is 40 times more absorbable than standard turmeric extracts, whilst Turmacin® contains turmerosaccharides and the inclusion of whole root provides many other supporting active ingredients. Turmeric is a spice prized in India for its many health benefits. 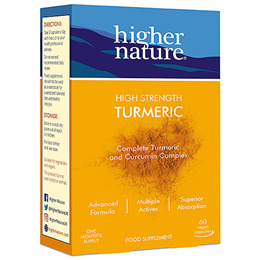 Curcumin is the most well studied active ingredient found in turmeric, but turmeric also contains other powerful beneficial actives including other curcuminoids, turmerosaccharides, turmerones and many others. Turmeric extract (12 - 14:1), turmeric (Curcuma longa) powder, capsule: hydroxypropyl methylcellulose; curcumin extract complex. Take 2 capsules a day with food, or as your health professional advises. Do not exceed recommended daily intake. Below are reviews of Higher Nature High Strength Turmeric - 60 Vegicaps by bodykind customers. If you have tried this product we'd love to hear what you think so please leave a review. This combination of Cavacurmin®, Turmacin® and whole powdered root provides a complete range of turmeric actives for maximum benefit.